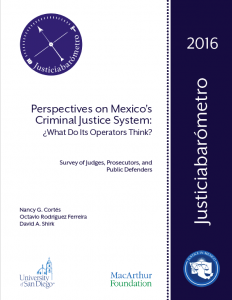 04/13/17 – Justice in Mexico, a research and public policy program based at the University of San Diego, released the English version of the latest publication in the Justiciabarómetro series, Justiciabarómetro 2016- Perspectives on Mexico’s Criminal Justice System: What do its operators think?, thanks to the generous funding from the John D. and Catherine T. MacArthur Foundation. The 2016 Justiciabarómetro provides a comparative analysis of the justice system operators’ demographics and perspectives, as well as comparisons to similar data collected in 2010. Survey participants included 288 judges, 279 prosecutors, and 127 public defenders in 11 Mexican states, with a response rate of 56%, a 2.4% margin of error, and a 95% confidence interval. The 2016 Justiciabarómetro builds on a series of surveys that Justice in Mexico has conducted since 2009. Through collaboration with bi-national teams of judicial system experts in Mexico, these Justiciabarómetro studies are intended to generate useful indicators of judicial system capacity and performance in order to contribute to both academic research and improved public policy efforts. The majority of the operators of all judicial system operators are male (56%), under the age of 50 (79%), and have a post-graduate degree (57%). 63% of judges surveyed earn more than $30,000 pesos each month, yet 72% of prosecutors and 82% of public defenders earn less than that amount. Nearly all of the operators (89%) believe the justice system needed to be reformed and that the New Criminal Justice System (Nuevo Sistema de Justicia Penal, NSJP) has had positive effects since it began in 2008. An additional 90% think the NSJP creates greater trust in authorities, and 93% more argue it will accelerate judicial processes. NSJP features are overwhelmingly well received, with roughly 95% of all operators preferring oral proceedings over previously implemented written methods, a significant increase from 2010 JABO results. Additionally, 98% prefer the use of alternative dispute resolution (ADR). The majority of respondents are in favor of the presumption of innocence (84% of judges, 76% of prosecutors, and 91% of public defenders) and believe the NSJP will help reduce corruption (80% of all operators). • 96% of all judicial system operators view judges as the most effective in their work when compared with prosecutors and public defenders, and an additional 96% view judges as the trust-worthiest. Despite overwhelming agreement when operators were asked if they were prepared for the NSJP’s implementation and operation (86% of judges, 93% of prosecutors, and 90% of public defenders), between 13% and 29% of operators reported having never been trained in oral litigation or alternative methods to resolve cases. A concerning 48% of prosecutors, 29% of public defenders, and 13% of judges believe authorities can operate above the law to investigate and punish individuals for crimes committed. This entry was posted in Judicial Reform, Publications, Special Reports, Uncategorized and tagged Criminal Justice System, Justice in Mexico, Justicebarometer, Justiciabarómetro, Mexico. Bookmark the permalink.